Green with Colour China - 48 items found. Lovely jar made for The National Trust. Backstamp Mason's Ironstone Made in England Oxburgh Made exclusively for The National Trust. A couple of very minor printing blemishes otherwise excellent condition. Backstamp: Mason's Patent Ironstone China Paynsley Pattn England Guaranteed Detergent Proof & Acid Resisting Colours. Backstamp:Mason's Patent Ironstone China Paynsley Pattn England Guaranteed Detergent Proof & Acid Resisting Colours. A little minor wear underneath the foot otherwise excellent condition. Backstamp: Mason's Patent Ironstone Paynsley Pattn England Guaranteed Detergent Proof Acid Resisting Colours. A little minor wear underneath the foot otherwise excellent condition. Printed in green with added colour. Green printed backstamp Masons over crown and Patent Ironstone on curtain, Paynsley Pattn, England, Permanent Detergent Proof Decoration beneath. Green printed with added colour. Green printed backstamp Masons over crown and Patent Ironstone China on curtain, Paynsley pattn, England, Guaranteed Detergent-Proof & Acid Resisting Colours beneath. Green printed with added colour. Green printed backstamp Masons over crown and Ironstone, Made in England on curtain, with C Paynsley, Permanent Detergent Proof Decoration. Backstamp:Mason's Patent Ironstone Paynsley Patt Made in England Paynsley Permanent Detergent Proof Decoration. Excellent condition. Green printed under the glaze with hand applied colour. Crazed. Green printed Masons above the crown and banner. Guaranteed Permanent Acid resisting colours. Large cup, without saucer. Backstamps vary a little: Mason's Patent Ironstone China Paynsley Patt Made in England Paynsley Permanent Detergent Proof Decoration. A little discolouration to the foot otherwise excellent condition. The taller style of cup. Backstamp: Mason's Paynsley Made in England Excellent condition. The wider brim style of cup. Backstamp: Mason's Patent Ironstone China Paynsley Patt England on cup. A little minor wear to the foot of the cup otherwise excellent condition. Large cup and saucer. Backstamps vary a little: Mason's Patent Ironstone China Paynsley Patt Made in England A little minor wear to the foot of the cup otherwise excellent condition. Backstamp: these vary a little, mainly Mason's Ironstone Made in England Paynsley Permanent Detergent Proof Decoration. A little surface scratching otherwise excellent condition. Backstamp: These vary a little, mainly Mason's Ironstone Made in England Paynsley Permanent Detergent Proof Decoration. A little surface scratching otherwise excellent condition. Depth of colour varies a little from plate to plate. Backstamp: These vary a little, mainly Mason's Ironstone Made in England Paynsley Permanent Detergent Proof Decoration. Some surface scratching and a little wear on the back otherwise excellent condition. Depth of colour may vary from plate to plate. 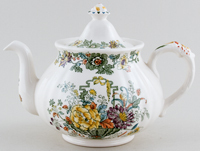 Pretty, small floral jar with cover made especially for Crownings Tea Merchants. Backstamp: MasonsPatent Ironstone China Paynsley Pattn England Made for Crownings London. Touch of crazing otherwise excellent condition. Made especially for Crownings Tea. Very pretty green floral ginger jar. Green printed backstamp: Mason's Patent Ironstone China Paynsley Pattn England Guaranteed detergent proof and acid resisting colours Made for Crownings London. A little wear under the foot otherwise excellent condition. 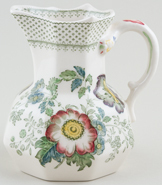 Gorgeous octagonal jug with serpent handle. Backstamp: Mason's Patent Ironstone China Strathmore England. Crazed with a little discolouration inside. Fabulous pot with moulded body and ornate detail to the handle and finial. Backstamp: Mason's Patent Ironstone China Strathmore England. Light all over crazing otherwise excellent condition. Lovely little octagonal pot with lid. Backstamp: Mason's Strathmore England. Crazed with some discolouration inside and a little minor wear under the rim of the lid. Fabulous bowl with pierced moulded side handles. Full pattern inside with part of the pattern either side of the body on the outside. Backstamp: Mason's Patent Ironstone China Strathmore Made in England. Excellent condition. Very pretty with moulded detail around the base of the cup. Backstamp: Mason's Patent Ironstone China Strathmore England C4897 Permanent Detergent Proof Decoration. A little wear to the rim of the cup otherwise excellent condition. Backstamp: Mason's Patent Ironstone Strathmore Made in England Permanent, Detergent Proof Decoration. Excellent condition. Backstamp: Mason's Patent Ironstone China Strathmore Made in England C4897 Permanent Detergent Proof Decoration. A little surface scratching otherwise excellent condition. Backstamps vary: Mainly Mason's Patent Ironstone Strathmore Made in England Permanent Detergent Proof Decoration. A little surface scratching otherwise excellent condition. A really lovely scenic plate. Backstamp: Hand Painted Tintern Alfred Meakin England A hand engraved pattern applied under the glaze. Permanent and acid resisting colours. Excellent condition. Porcelain with gilt. 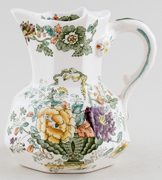 A stunning jug with extremely ornate handle and embossed detail to the body. It would have originally been part of a breakfast service. No backstamp. Provenance: The Geoffrey Godden Collection A little minor wear, overall excellent condition. Lovely shape of pot with ornate handle. 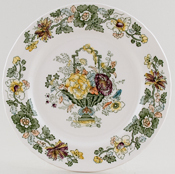 Backstamp: Ridgway Est 1792 Staffordshire England All Colours Guaranteed Underglaze And Detergent Proof Old English Bouquet. Excellent condition. An absolutely gorgeous piece with embossed decoration to the side handles. Backstamp: Copeland, in script 177 and impressed Copeland Crown. Light crazing otherwise excellent condition. 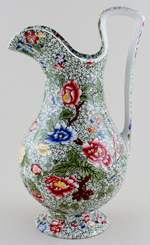 A tall ewer of graceful proportions, decorated in a colourful floral design set against a background of small green leaves. Backstamp: impressed Copeland over a crown, printed Copeland late Spode seal mark and Soane & Smith, 462 Oxford St., London W in an oval with Copeland beneath. Impressed date code N over 10 for November 1910. In script pattern number T over 706. The T series was for toilet ware patterns and was begun in January 1907 at 500. An extremely pretty small ewer with ornate scroll handle and moulded detail around the rim and foot. Backstamp: Forget Me Not. There is a little wear to the handle and inside some minor discolouration, overall excellent condition. 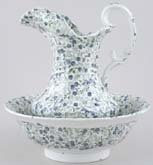 Very pretty set with lovely mouded detail around the rim of the bowl and the foot and rim of the ewer. Backstamp: Forget Me Not. There is a small chip and very small glazing fault to the foot of the bowl. 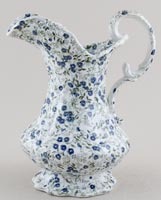 The ewer is in excellent condition. 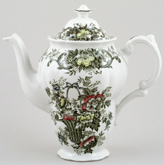 Green line decoration around the rim and along the handle with a band of pink roses around the body. Backstamp: In green script 1277. Light all over crazing with a little minor wear and inside just a hint of discolouration. 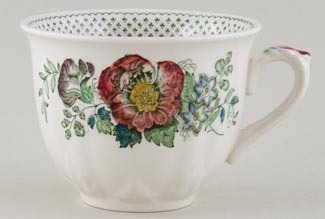 Very pretty cup and saucer, the cup in a particularly attractive shape. Backstamp: No 21. The saucer has light crazing with a little surface scratching and one of the stilt marks has suffered a little over the years resulting in a small hole. The cup has a little excess clay inside to the base which has worn a little otherwise is in excellent condition. 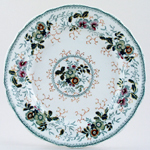 A stunning platter in a chinoiserie floral pattern, green printed with hand applied colour and blue rim. The body is very white and is translucent, so appears to be Stone China. Backstamp: green printed, but poorly printed and indecipherable. In small script is the pattern number 5679 and a large impressed F. With that high pattern number this must have come from a major manufacturer and Copeland & Garrett are candidates, using that pattern number in 1836, but there is no real evidence to attribute this platter to them. There is some discolouration to part of the rim and the outer rim is quite worn. There is a short hairline or craze line in the glaze to the inner rim about 3/4 of an inch long, on the edge of the bowl, but this does not go through to the back. Otherwise the glaze is sound. On the rim at one end are two marks, where the platter rested on the supports in the kiln, one could be taken for a small chip, but it is not. Overall this really is in excellent condition and would be sure to make a stunning display piece. 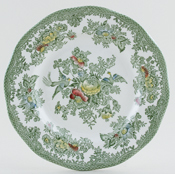 Wedgwood and Co version of Asiatic Pheasants, also known as Oriental Pheasants and Kent, printed in green with a little added colour. Backstamp: Enoch Wedgwood (Tunstall) Ltd The Original Manufacturers of Oriental Pheasants Founded in 1835 Made in England A Genuine Staffordshire Hand Engraving Decorated Under Glaze Detergent And Acid Resisting Colours. A few little printing blemishes otherwise excellent condition. 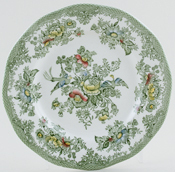 Wedgwood and Co version of Asiatic Pheasants, also known as Oriental Pheasants or Kent, printed in green with a little added colour. 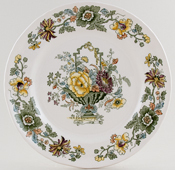 Backstamp: Enoch Wedgwood (Tunstall) Ltd Est 1835 England on saucer, impressed England on cup. A few minor signs of wear, overall excellent condition. Wedgwood and Co version of Asiatic Pheasants also known as Kent or Oriental Pheasants, printed in green with a little added colour. Backstamp: Enoch Wedgwood (Tunstall) Ltd The Original Manufacturers of Oriental Pheasants Founded in 1835 Made in England A Genuine Staffordshire Hand Engraving Decorated Under Glaze Detergent And Acid Resisting Colours. Excellent condition. Depth of colour may vary a little from plate to plate. Wedgwood and Co version of Asiatic Pheasants also known as Kent or Oriental Pheasants, printed in green with a little added colour. Backstamps vary: Enoch Wedgwood (Tunstall) Ltd The Original Manufacturers of Oriental Pheasants/Asiatic Pheasants Founded in 1835 Made in England A Genuine Staffordshire Hand Engraving Decorated Under Glaze Detergent And Acid Resisting Colours. Excellent condition. Depth of colour may vary a little from plate to plate. An absolutely stunning dish with fabulous colours and ochre rim. Backstamp: Impressed Granite China W C & Co. and in script 4095. Light all over crazing with just a hint of discolouration on the back otherwise excellent condition.